On Tuesday, I went to my initial appointment with my new rheumatologist. I almost didn’t find the building because my gps at the last second decided to restart as soon as I turned onto the correct street. There were multiple doors that I could’ve entered once I finally found the correct building, and considering I was alone(without parent’s) for this appointment, I was intimidated at how busy the place was. The lady at the front desk could tell I was clueless, so she guided me along the process of filling out new patient information. For insurance purposes, she asked me for my father’s birthday to which I replied, “Uhh, well I know it’s in February…”. Gee, that sure made me feel like a horrible daughter! Fortunately, before I left, I was able to get that information to her. So, after having filled out the emergency contact form, I was told sit in the waiting room. Naturally, I was the youngest patient there. If I were to guess, I’m sure the majority of the other patient’s waiting to be called upon were in their upper 70s, though I did see a middle aged man and woman. It’s always interesting when you are in a rather quiet room, and two people start talking, loudly. Two older men were talking about how “it’s hell to get old”. Very comforting, just what I wanted to hear. Not too long after the scheduled time I was supposed to have my appointment, my name was called and they took my weight, blood pressure, and I was asked a series of common health questions concerning myself and my family’s history. I met my new Dr. and was pleased at how kind he was. After he looked through the paperwork that was transferred from my previous Dr. he noticed that I am low on Vitamin D. He told me I should be taking a daily supplement, and to try to get more sunlight, but to be careful since one of the medications I am on advises that I don’t get too much exposure since I could have a reaction. He also noticed that my elbows and wrist were a bit swollen. He went ahead and raised the amount of methotrexate I will have to take. It went from four pills once a week to six pills once a week. So, on Sunday’s, I will be taking six methotrexate, one plaquenil, and one folic acid. Monday-Saturday I take a folic acid and a plaquenil. Afterwards, I had to get blood work taken. Up until this point, everything had gone smoothly. A lady called my name and I sat down, thinking she would at least make small talk. Instead, I sat there awkwardly and didn’t even get a warning before she stuck the needle in my vein. Personally, I don’t mind needles, however, the lady must have stuck me a bit too far (I’m sorry this is a bit gross, so don’t read if you get easily nauseous). By the time I got home, I could tell something was wrong cause it hurt to bend my arm. 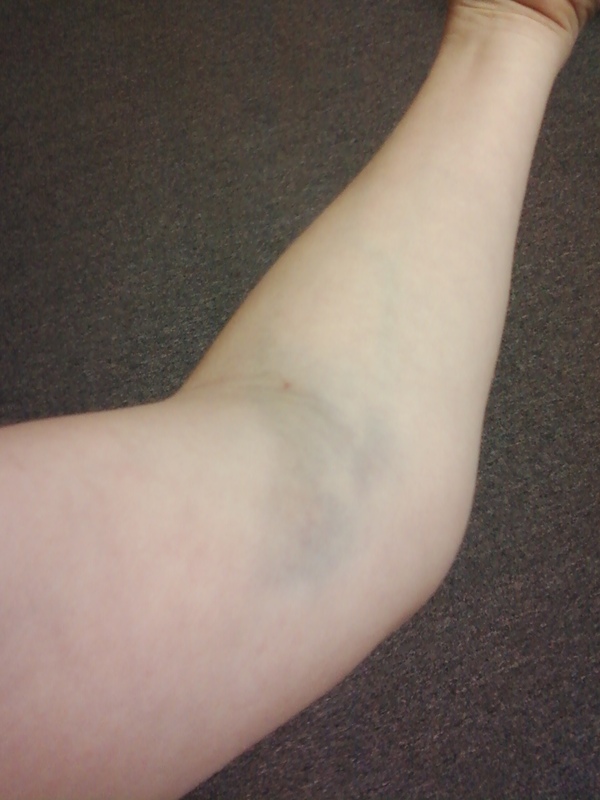 I’m not sure if it was just fluid or if it was blood, but my arm was puffy and bruised. I realize it is pretty common for people to bruise, but from the all times I have given blood and have had blood work taken, I haven’t had this sort of reaction. For those of you who bruise when you give blood, this picture is probably nothing compared to what you’ve dealt with, but regardless, it hurts! Until next time, don’t trust just anyone when getting blood work taken.